Port Vale substitute Sam Kelly struck a superb, late equaliser to earn a well-deserved point against Coventry City. City keeper Reice Charles-Cook denied Vale striker AJ Leitch-Smith four times as Vale dominated in the first half. Jacob Murphy put the Sky Blues ahead against the run of play when he rounded Jak Alnwick and passed the ball in. Charles-Cook saved brilliantly from Carl Dickinson's free-kick after the break, but was unable to stop Kelly's 20-yard, 84th-minute left-foot stunner. Summer signing Kelly's goal, the second he has scored as a Vale substitute this season, came just four minutes after coming off the bench to replace Byron Moore. City are now without a win in five games, while Vale, who lost defender Ryan Inniss with a first-half hamstring injury, are unbeaten in 11 home league matches - their best run since John Rudge's side 22 years ago. "I'm extremely proud of the players to have done that because of the managers that have been here before. John Rudge is an absolute hero at this club and rightly so. "They've given that level of performance week in, week out. To have only lost one going into the second week of February is a great achievement. "This run has been about levels of performance. When you give that level of performance from 1 to 11 then you will win more than you lose. I think teams will respect us." "It was going to take something pretty special to beat Reice. It's important to collect points from games like this but we've got 16 games to go and we need to start winning. "We changed tactics. We've been working on ways to win. We scored a lot earlier in the season through breaking away and using our speed to get behind. And we did that ok at times. "We probably should have scored a few more as we've had a few great chances and one cleared off the line at the end." Match ends, Port Vale 1, Coventry City 1. Second Half ends, Port Vale 1, Coventry City 1. (Port Vale) wins a free kick in the defensive half. Attempt saved. Darius Henderson (Coventry City) header from the left side of the six yard box is saved in the centre of the goal. Corner, Coventry City. Conceded by Sam Foley. Corner, Coventry City. Conceded by Matthew Kennedy. Corner, Coventry City. Conceded by Carl Dickinson. Foul by Darius Henderson (Coventry City). Andy Rose (Coventry City) wins a free kick in the attacking half. Goal! 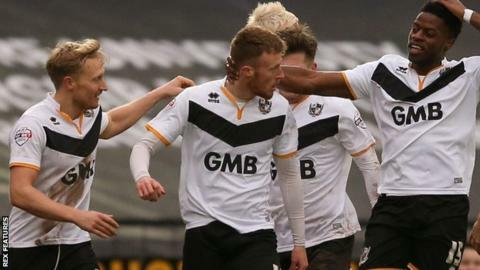 Port Vale 1, Coventry City 1. Sam Kelly (Port Vale) right footed shot from outside the box to the top left corner. Substitution, Coventry City. Jim O'Brien replaces Jacob Murphy. Corner, Port Vale. Conceded by John Fleck. Corner, Port Vale. Conceded by Sam Ricketts. Attempt missed. Anthony Grant (Port Vale) left footed shot from outside the box is too high. Corner, Port Vale. Conceded by Jack Stephens. Darius Henderson (Coventry City) is shown the yellow card. Corner, Port Vale. Conceded by Adam Armstrong. Attempt missed. Richard Duffy (Port Vale) header from the centre of the box is just a bit too high. Corner, Port Vale. Conceded by Peter Ramage. Substitution, Coventry City. Darius Henderson replaces James Maddison. Byron Moore (Port Vale) wins a free kick on the left wing. Corner, Coventry City. Conceded by Jak Alnwick. Attempt saved. Adam Armstrong (Coventry City) left footed shot from the centre of the box is saved in the bottom left corner. Hand ball by James Maddison (Coventry City). Attempt missed. Richard Duffy (Port Vale) header from the right side of the six yard box is just a bit too high. Corner, Port Vale. Conceded by Reice Charles-Cook. Attempt saved. Carl Dickinson (Port Vale) left footed shot from outside the box is saved in the top left corner.